This is the first post in The Guth Research Update Series. The series will be focused on the ancestors of two German born brothers – Francis Xavier and Leopold Guth who settled in Clarion County, Pennsylvania in the mid 1800's. Over the last two years the family has been extensively researched with the assistance of Ute Brandenburg the owner of German Script Experts. I am thrilled to finally share the validation of the original research completed by Jr. Janet Staab many years ago. The Guth Research Update Series will also feature previously unknown Guth family members. Many years ago Sr. Janet Staab, my cousin and a fellow descendant of Leopold Guth, completed the original research on the Guth family. Her records indicated that two brothers, Francis Xavier and his younger brother Leopold Guth were born in Untersimonswald, Baden, Germany. Based on the evidence available to date Francis Xavier Guth departed Germany in the 1840's. It appears that Leopold followed in his older brother's footsteps departing Germany in the early 1850's. The brothers settled in Clarion County, Pennsylvania. They were well known in Clarion as business owners - for their trade as jewelers and watchmakers. In the late 1870's the brothers owned several tracks of land in Clarion, Clarion County, Pennsylvania. 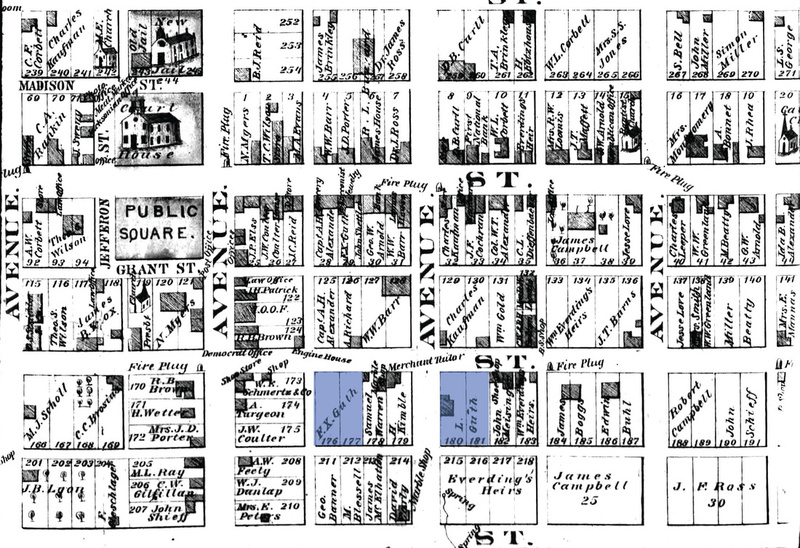 The 1877 Illustrated Atlas of Clarion County shows the two brothers owning property in the center of Clarion on Wood Street. Each brother is shown with a double lot. Francis Xavier Guth listed with property number 176 and 177 at the intersection of Wood Street & Fourth Avenue. Leopold Guth listed with property 180 and 181 at the intersection of Wood Street & Fifth Avenue. Land Owned by Francis Xavier and Leopold Guth shaded in blue. The 1877 Illustrated Atlas of Clarion County also identifies tracks of land to the south of town owned by the brothers. In two instances the brothers owned tracks of land located adjacent to each other. The older of the two brothers, Francis Xavier Guth, married a fellow German immigrant - Fortunata Kemmerer. The couple married prior to 1850 as they were enumerated in the 1850 United States Federal Census living in Elk, Clarion County, Pennsylvania. Sometime between 1850 and 1860 the couple relocated to Clarion, Clarion County, Pennsylvania where they were enumerated in the 1860 United States Federal Census with their children. Francis Xavier Guth would live in Clarion for the rest of his life. 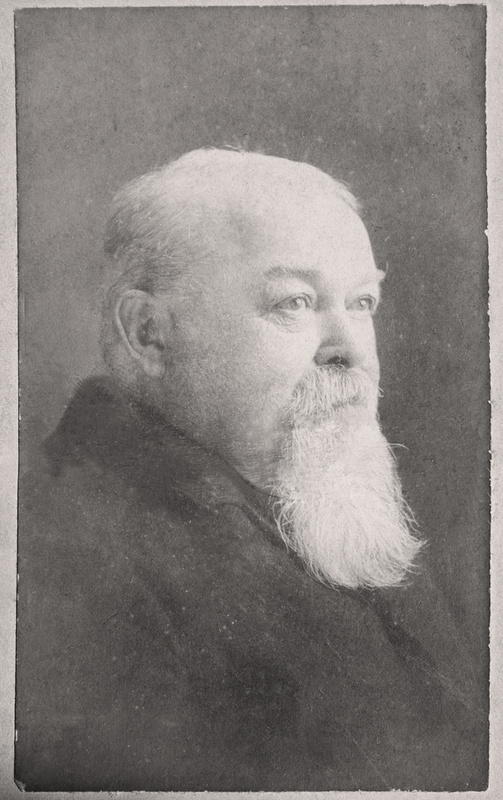 Francis Xavier Guth was 59 years old when he passed away on 15 April 1885. He is buried at the Immaculate Conception Cemetery in Clarion, Clarion County, Pennsylvania. Leopold Guth was five years younger his brother Francis Xavier Guth. He departed Germany in the 1850’s. Leopold Guth married Theresa Loll on 20 January 1853 at the Immaculate Conception Church in Clarion, Clarion County Pennsylvania. Theresa, also an immigrant, was born in Marcholsheim, Alsace, France. She was the daughter of Antoine Loll and Mary Ann Jehl. The 1860 United States Federal Census records Leopold and Theresa living in Clarion, Clarion County, Pennsylvania with their children. The couple would reside in Clarion, Clarion County, Pennsylvania for the rest of their lives. In time Leopold would become a well-known member of the community which is noted in his Obituary. Leopold Guth was 74 years old when he passed away on 13 June 1905. He is buried at the Immaculate Conception Cemetery in Clarion, Clarion County, Pennsylvania. Sr. Janet’s research included two generations of ancestors for Francis Xavier Guth and Leopold Guth as shown in the copy of the original hand typed chart below. Sr. Janet’s well-kept records included names, dates and locations. Some of the her records did list sources. Unfortunately not all the records shared with me listed the original sources used to complete the research. It also was not clear if Sr. Janet did all of the original research or if some of the research was completed by others. As mentioned in my post Remembering Sr. Janet Staab, OSB Sr. Janet's research served as the foundation for what we know about the Guth and the Selker families. One of my research goals was to validate her original research through sources. Over time I have been able to validate events that occurred in the United States through birth, marriage, death, census and other records. The one major gap was validating the German ancestors of Francis Xavier and Leopold Guth. To accomplish that goal I engaged Ute Brandenburg the owner of German Script Experts to validate the initial research on the German families. Over the last two years Ute has been able to both validate and expand the original Guth research using German Catholic Parish Registers. Records from 1810-1869 were accessed online at Landesarchiv Baden-Württemberg. Records prior to 1810 were obtained from the Family History Library in Salt Lake City, Utah. Ute makes regular visits to Salt Lake City to complete research for clients. While onsite she went through the microfilm to locate Guth family members. After locating the records she documented the original German and provided an English translation. 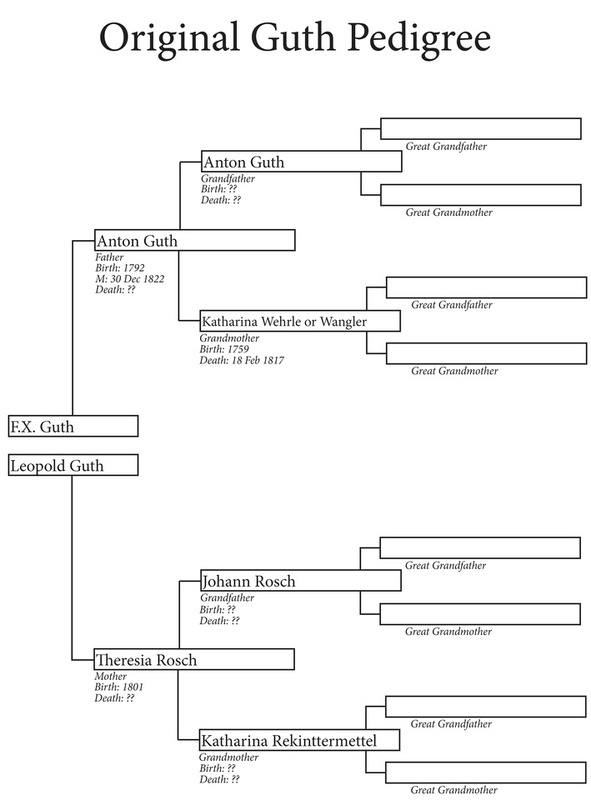 The original Guth pedigree based on Sr. Janet Staab's records is shown below. This would serve as the basis to validating the research. The starting point for the project was to research the Untersimonswald Catholic Parish Register. The original family records from Sr. Janet indicated the brothers were born in Untersimonswald. Various other sources also pointed to Untersimonswald. Leopold Guth was married in a Catholic Church and his children were also baptized Catholic. Baptism records for Francis Xavier Guth and Leopold Guth were located in the Untersimonswald Catholic Parish Register. The brothers were born in 1825 and 1830. 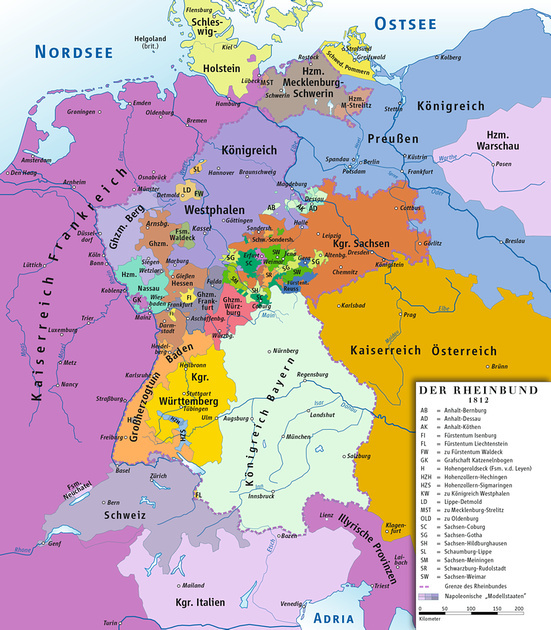 At this time of their birth Untersimonswald was in German territory known as the Grand Duchy of Baden. Today Untersimonswald would be associated with the German State of Baden-Württemberg which was established after World War II. October Nachmittags zwey Uhr geboren und Abends fünf Uhr getauft: Franz Xaver ehler des Anton Guth, Uhrenmacher, und der Theresia Rösch von da. Born at 2 o’clock in the afternoon on 30 October 1825 in Untersimonswald, and baptized that evening at 5 o’clock: Franz Xaver, legitimate [son] of Anton Guth, clock maker, and Theresia Rösch, from there. Witnesses: Joseph Beck, teacher here, and Joseph Rösch, unmarried farmer’s son from Haslach, who was a sponsor along with Maria Karstinger. Im Jahre tausend achthundert dreysig am vierzehnten November Mittags zwölf Uhr wurde in U. Simonswald geboren, und denselben Tag Abends fünf Uhr dahier getauft Leopold ehler Sohn des Anton Gut, Uhrenmacher, und der Theresia Rösch von da. Zeugen sind: Hr. Joseph Rösch, Bauer in Haslach, Pathe mit Maria Karstinger, Kieferin dahier, und Joseph Bek, hiesiger Schullehrer. Born in Untersimonswald on 14 November 1830 at 12 noon, and baptized the same day at 5 o’clock in the evening: Leopold, legitimate son of the clock maker Anton Gut and Theresia Rösch, from here. The witnesses were: Mr. Joseph Rösch, farmer in Haslach, who was also a sponsor along with Maria Karstinger, cooper’s wife here, and Joseph Beck, school teacher from here. It is plausible that Leopold was named after Grand Duke Leopold of Baden. Grand Duke Leopold succeeded Grand Duke Louis I on 30 March 1830. The Grand Duke would serve as the ruler of the Duchy. The baptismal records validate the birth dates and birth location of Untersimonswald for Francis Xavier and Leopold Guth. The baptismal records also validate that the brothers are the children of Anton Guth and Theresia Rösch. The reference to "legitimate son" indicates that Anton Guth and Theresia Rösch were married in the Catholic Church prior to the birth of their children. An additional observation is that Francis Xavier was recorded with the surname Guth and Leopold was recorded with the surname Gut. We discovered that the surname would vary between Guth and Gut depending on the record. One difference is the German spelling of Rösch recorded in the records uses the umlaut mark. Baptismal dates for Francis Xavier & Leopold Guth. The surname of Rösch was corrected from Rosch to incorporate the use of the umlaut mark. This concludes the initial Guth Research Update post. The next post in the series will feature the parents of Francis Xavier and Leopold Guth - Anton Guth and Theresia Rösch. Leopold Guth is my 3rd great-grandfather. Francis Xavier Guth is my 4th Great Uncle. Anton Guth and Theresia Rösch are my 4th great grandparents. My connection to the Guth line extends through Leopold's daughter Frances Philomena Guth, her daughter Frances Philomena Selker, to my paternal grandmother Mary Eugenia McDonald. 1850 United States Federal Census. Year: 1850; Census Place: Elk, Clarion, Pennsylvania; Roll: M432_767; Page: 247A; Image: 499. Record for F. H. Gut. 1860 United States Federal Census. Year: 1860; Census Place: Clarion, Clarion, Pennsylvania; Roll: M653_1095; Page: 68; Family History Library Film: 805095. Record for Leopold Guth. 1860 United States Federal Census. Year: 1860; Census Place: Clarion, Clarion, Pennsylvania; Roll: M653_1095; Page: 79; Family History Library Film: 805095. Record for Francis X Guth. U.S., Indexed County Land Ownership Maps, 1860-1918 [database on-line]. Provo, UT, USA: Ancestry.com Operations, Inc., 2010. Town: Clarion, Map: 1877. F.X. Guth. U.S., Indexed County Land Ownership Maps, 1860-1918 [database on-line]. Provo, UT, USA: Ancestry.com Operations, Inc., 2010. Town: Clarion, Map: 1877. Leopold Guth.